Louisville, KY - A sailor from the Ohio-class ballistic missile submarine USS Kentucky (SSBN 737) will re-enlist in Louisville on Thursday night, July 2, 2009. Brigadier General Michael J. Dornbush, chief of joint staff for the Kentucky National Guard will administer the enlistment oath to Master Chief Machinist’s Mate (SS) Scott Moore in a ceremony during Military Appreciation Night at Churchill Downs. Moore is USS Kentucky’s gold crew chief of the boat or COB. Moore will be joined by four fellow shipmates, Lieutenant Commander Adam Hudson, the crew’s executive officer, as well as Petty Officer Second Class Adam Sassi, Petty Officer Third Class Eric Louttie, and Petty Officer Third Class Jeremy Boone. Following Moore’s re-enlistment on Thursday night, the five sailors will tour Kentucky and Indiana in conjunction with the Independence Day-weekend before returning to USS Kentucky’s homeport in Bangor, Washington. On Friday, they will make a number of visits in and around Louisville before heading to Madison, Indiana, and participation in the Madison Regatta Parade. They will then travel to Worthington, Kentucky, outside of Ashland where they will meet with community members and participate in a number of Fourth of July festivities. 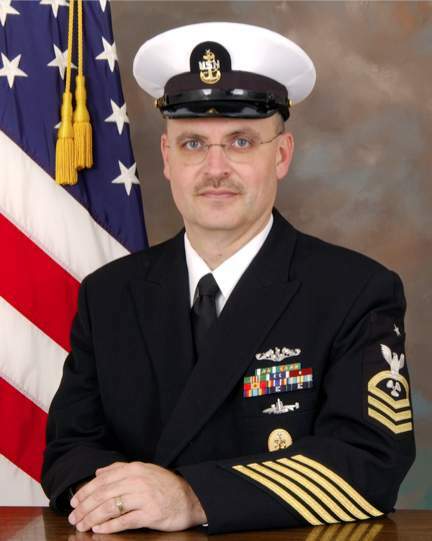 Moore, a native of Garden City, Michigan, enlisted in the Navy on June 20, 1984. He qualified in submarines, earning his “dolphins,” aboard USS Whale (SSN 638). In addition to a variety of shore duty assignments, he served aboard three additional submarines prior to USS Kentucky: USS Tennessee (SSBN 734), USS West Virginia (SSBN 736), and USS Louisiana (SSBN 743). While on patrol in April, he was promoted to master chief petty officer, the Navy’s most senior enlisted rank. Senior Chief Scott Moore, joined the United States Navy on June 20, 1984. Upon graduation from Recruit Training Command, Great Lakes, IL, he completed Machinist Mate “A” school, Basic Submarine Enlisted Submarine School and Auxiliary Package Course prior to his first sea duty. Senior Chief Moore’s first sea duty assignment was onboard USS WHALE (SSN-638), a Sturgeon class fast attack submarine, where he advanced to MM2 and earned his Enlisted Submarine Warfare Insignia. After a shore assignment with Nuclear Field “A” School in Orlando, FL which included advancement to MM1, he returned to sea duty onboard USS TENNESSEE (SSBN-734)(GOLD) and advanced to MMC. Despite being shore duty eligible, he requested to remain on sea duty and reported to USS WEST VIRGINIA (SSBN-736) (BLUE) as the Auxiliary Division Leading Chief Petty Officer. Forced to shore duty after eight and a half straight years of sea duty and advancement to MMCS, NAVSEA recruited and selected him as the Assistant Officer in Charge of the NAVSEA Performance Monitoring Team (PMT), Kings Bay, GA.
Desiring a change of scenery, Senior Chief Moore requested and reported for duty as the 3-M Coordinator onboard USS LOUISIANA (SSBN 743)(BLUE) which was preparing for a homeport change from Kings Bay, GA to Bangor, WA. While onboard LOUISIANA, he completed Chief of the Boat qualifications. Senior Chief Moore is a graduate of the Navy Senior Enlisted Academy class 131 and Chief of the Boat/Command Master Chief course class 39. He is authorized to wear the Navy and Marine Corp Commendation Medal (three awards), Navy and Marine Corps Achievement Medal (five awards), Meritorious Unit Commendation, Navy “E” Ribbon (two awards), Good Conduct Medal (six awards), National Defense ribbon (two awards), Global War on Terrorism Service Medal, Military Outstanding Volunteer Service Medal, Sea Service Deployment Ribbon, Expert Rifleman Medal, and the Expert Pistol Shot Medal. The first KENTUCKY, a confederate transport, was captured by the union Navy in June, 1862; the name KENTUCKY was retained. She was assigned to the Mississippi squadron in support of union forces performing various transport duties on the Mississippi River and its tributaries. KENTUCKY sank in June, 1865, by accident with great loss of life, while operating on the Red River. Among those who died were some thirty paroled confederate soldiers. The career of the second KENTUCKY (BB-6), a turn-of-the-century battleship, lasted for twenty years. About the size of a World War II destroyer, she was one of the most advanced warships of her day and the first American battleship to make extensive use of electricity and to provide ventilation below decks. Launched in March, 1898 and commissioned in May, 1900, the battleship sailed to Hong Kong in 1901 and became the flagship of the Asiatic Fleet, watching over American interests in the Far East. Upon her return to the United States in 1904, KENTUCKY was involved in tactics and maneuvers off the Atlantic coast with the North Atlantic Fleet. In the fall of 1906, she transported marines to Havana and offered support to forces ashore during the Cuban insurrection. In 1907 she returned to Hampton Roads, Virginia, to join the “Great White Fleet” of sixteen battleships on a fourteen-month cruise around the globe. The voyage was widely acclaimed for the honor it brought to the United States Navy and for its demonstration to the world of America’s strength. Following the successful cruise, she was decommissioned, though she was recommissioned in June, 1915 as a training vessel. Later that year she sailed to the coast of Mexico to protect American interests during the period following the Mexican Revolution. During World War I, KENTUCKY served as a training ship for thousands of recruits along the Atlantic Coast. She was finally decommissioned in May, 1920. Construction was begun on a third KENTUCKY (BB-66), an lowa-class battleship, but was never completed. Her keel was laid in December, 1944, but construction was suspended in 1947 when the vessel was 70 percent complete. Technology has dramatically changed the size and capabilities of naval warships since the battleship KENTUCKY was commissioned in 1900, but the mission of the United States Navy has not significantly changed. That mission is to protect the vital interests of the United States of America. KENTUCKY (SSBN 737) is uniquely suited to this task. The submarine USS KENTUCKY (SSBN 737) is the third U.S. Naval vessel to be named in honor of the Bluegrass state, and the twelfth Trident submarine commissioned.